When you have cancer you have to go see a lot of doctors and get a lot of tests and inevitably, at whatever office or lab or hospital you are visiting, you will be forced to sit in a waiting room. And sit. And sit. And sit some more. General practice doctor, who just moved into a new office in Burbank. Nice enough room but really uncomfortable chairs. Specialist in Glendale. One big open area for a bunch of different doctor’s offices. Bad fake plants that brush against the back of your head and magazines that talk a lot about the Olymics… in Beijing. Gasto-Guy in Burbank. Very small room with only a couple of chairs and so sometimes there aren’t enough places for everyone to sit. Outpatient testing facility in Burbank. All the chairs have plastic on them and the TV plays way too loud. Oh and this is the place I waited for 30 minutes before they told me they were too backed up and couldn’t run my tests. Admitting waiting room at St. Joseph’s in Burbank. Lots of chairs but they all face each other in sort of a circle so inevitably you are sitting there looking at some other sick person and wondering, as they most likely are, which one of you is sicker. Go at the right time and there will be a piano player in the nearby lobby playing easy listening tunes. They apparently think this classes up the joint. I think it makes it feel like a hotel lounge near the airport in Topeka. Surgical waiting room at St. Joseph’s. This is a big open room where you wait after you have been admitted. It is adjacent to the elevators and another major hallway so there’s lot of traffic and little chance to try to find your Zen place before you go off to have done whatever it is you’re about to have done. Alameda Surgery Center in Burbank. Another very small room with not enough chairs. Pre-operative testing waiting room, St. Joseph’s. This is where they stick you when you are waiting to get stuck… by needles, to have your blood drawn. The room at one point must have been an x-ray room of some type because there is one of those little closet with a window type things in the corner where the technicians can step into during the tests. It now has a couple of mismatched chairs, a battered coffee table, a sad looking plant, and a couple of pictures of Jesus. I think it’s supposed to be comforting but I just sat there feeling guilty for reasons I was unable to identify. 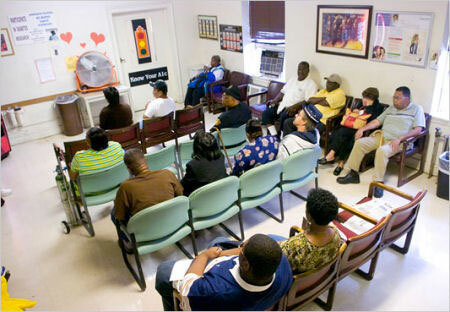 EKG waiting room at St. Joseph’s. This is where you wait before you have your EKG or EEG or any of those types of tests that involve electrodes being put on various parts of your body. It’s a fishbowl with windows on 2 sides looking out to busy hallways. Not at all uncomfortable to sit there (insert sarcasm here). Dr. Frenchy’s waiting room. There are actually multiple waiting rooms here and they were all completely full when I visited – not a chair in sight. The rooms themselves are done with very cold, white, grey, and black furnishings and lots of frosted glass. On one wall there is a long triptych style painting that is all black – three black panels – in front of which sits a chrome and glass sidetable and a stainless steel vase. I wanted to bleed on something just to give the room some color. Dr. Wile E Coyote, Super Genius’s waiting room. This is in the same building as Dr. Frenchy’s but it’s warmer and actually has windows and a fish tank. I like the former but the latter kind of creeps me out. I felt them judging me just like the pictures of Jesus. So what would I want in a waiting room? Comfortable chairs, number one. They don’t need to be barcaloungers (although that would be nice), but comfortable padding on both the seat and the arms and, most importantly, enough spacing between them so that you don’t feel like you are right on top of the person next to you. Light is important and I know that windows aren’t always an option architecturally but at least go for something other than harsh fluorescents. Nobody looks good in fluorescent lighting. Plants are fine but make them real and keep them healthy. Artwork – keep it simple yet colorful and evocative. If it were up to me I’d go for photography – cityscapes and landscapes – identifiable landmarks that will make the people in the room think, “I need to get better so I can go there.” A TV is fine, but please do not have it tuned to the news or those stupid health network things. Reruns of the Golden Girls and Designing Women – that’s TV comfort food. And forget the silly magazines unless you are committed to keeping them current. Last, but not least, a solid, public WiFi signal. The bulk of people in waiting rooms want to look at their phone or tablet while they are waiting, so let them!